in the lectionary-apparatus of Codex M.
Today we continue to test the accuracy of some statements in Daniel Wallace’s Credo Course lecture on John 7:53-8:11. 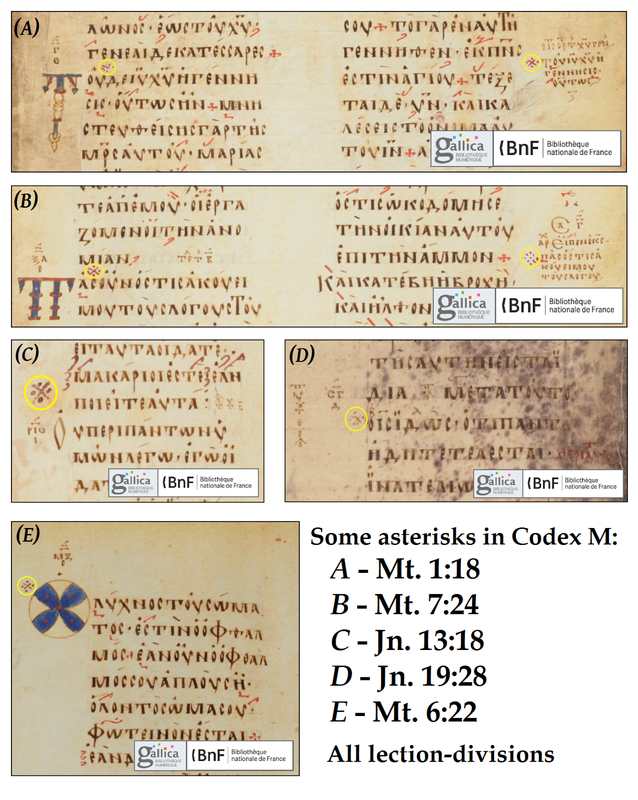 If Dr. Wallace believes that asterisks are never used in the lectionary-apparatus, then he needs to explain why, in 130 manuscripts (not just “several”), asterisks or special marks of some sort accompany John 8:3-11, and not John 7:53-8:2. Robinson’s model explains that: in the Byzantine lectionary, John 8:3-11 constituted a distinct lection (namely, the reading for Saint Pelagia’s Day, October 8), embedded within the lection for Pentecost. Wallace’s approach, meanwhile, seems to require that the scribes of these manuscripts accepted John 7:53-8:2, but rejected John 8:3-11. Wallace also stated: “In some manuscripts, it stands as an independent pericope between Luke and John.” That is just not true. Only one manuscript comes close to fitting that description: minuscule 1333, which does not have the entire passage between Luke and John – only John 8:3-11. Furthermore, 1333 features a rubric that identifies the passage as an excerpt from the Gospel of John. Only when these details go unmentioned can listeners get the impression that John 7:53-8:11 floated its way into this location as a previously freestanding text. When the details are known, it is obvious that all that has happened in minuscule 1333 is that after this manuscript was written (without the story of the adulteress), someone wrote the lection for Saint Pelagia’s Day on what had previously been a blank page between Luke and John. ● In the tenth minute of the lecture, Wallace mentioned manuscript 115, describing it as “the only manuscript I know of” in which the pericope adulterae appears after 8:12, and is also followed by 8:12. Wallace then proposed that the scribe of 115, after writing John 8:12, noticed that his exemplar was missing the story about the adulteress, found a different exemplar that contained it, and then added it after 8:12. Digital images of 115 are online. (By the way, 115 is not the only manuscript like this; the text is rearranged the same way in minuscules 1050, 1349, 2620, and 2751.) A close examination of the manuscript shows that a scribe (probably the scribe of 115’s exemplar) merely simplified the lector’s job on Pentecost, so that he would not have to jump from 7:52 to 8:12 in order to find the final portion of the Pentecost-lection. Small horizontal lines in 115 at the beginning of John 7:37 and at the end of 7:52 represent the beginning, and the end, of the main part of the lection. In other words, what we have in 115 is not the movement of the PA, but the repetition of 8:12; the verse appears after 7:52 to complete the Pentecost-lection. 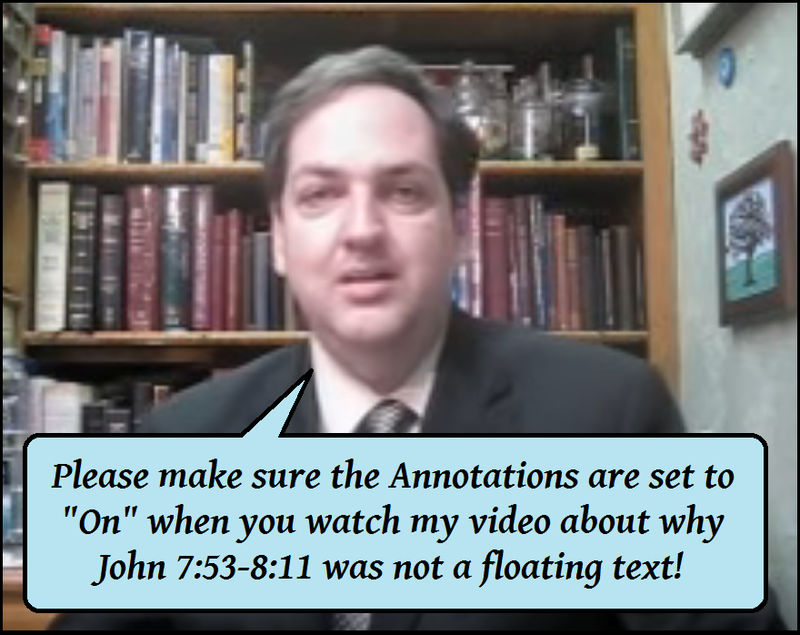 Regarding the other evidence that Wallace misinterprets as if it implies that the story of the adulteress was a “floating text,” see my video from last year. 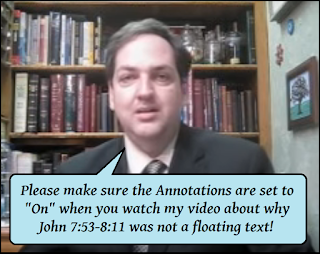 Several other features in the second half of Wallace’s lecture on John7:53-8:11 could be analyzed and shown to be problematic in one way or another. For example, at one point, he refers to Dura-Europos, a site in eastern Syria, when I think he meant Tura, a site in Egypt. At another point, Wallace commends an article by Kyle Hughes, although Hughes appears to weigh in against Wallace’s assertion that the pericope adulterae was a floating text: Hughes affirms that the dislocations to the end of the Gospel of John, and to a position after Luke 21:38, “can then be explained by the influence of the lectionary system in combination with the confusion resulting from the many early manuscripts of John’s Gospel that did not have PA.” And at another point, Wallace says that 20% of our Greek manuscripts of John don’t have the story of the adulteress; the actual percentage is more like 15%. In conclusion: the Credo Course lecture about John 7:53-8:11 contains a problematically high amount of inaccuracies, half-truths, and misinformation, and should not be considered a reliable resource. Thanks James for again heralding the truth. I will pray that one day you and Dr. Wallace will be given the opportunity to debate some of these matters in a public forum so the Body of Christ can discern the truth. When a person of Dr Wallaces stature and position makes these type of assertions and truth-challenged statements it sad because the Body of Christ suffers. Thank you again for taking a stand for the Truth of the Gospel. Mr. Snapp, of course the PA is not an interesting Textual Criticism question to a Skeptic but out of curiosity, is there any other Greek reading with the lack of early Greek Manuscripts that the PA has, that you think is original? 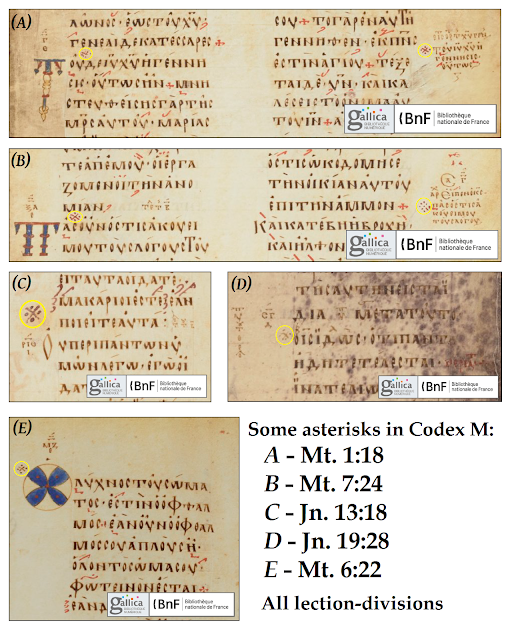 I'm looking at microfilm of Codex Basilensis (E 07, dated VII-IX, consensus early VIII) on the csntm.org website, and the PA is on folios 276 and 277. E is mentioned by critics as one of the mss that mark the PA with asterisks, and sure enough it does--but not in the way Wallace claims--which comes as no surprise to anyone who has actually gone to the work of examining the evidence. John 7:52 in E 07 ends with a raised dot, followed by a Pi/Upsilon lexical symbol in the line; then "the PA" begins, with no asterisk for the first three lines. The first asterisk (an x with a dot in each angle) on the verso of folio 276 is alongside the line where John 8:1 ends and 8:2 begins (about midway in the line, marked by a raised dot). Then each line has an asterisk in the left margin, continuing onto the verso of folio 277, where the last asterisk is to the left of the line containing the next-to-the-last word of 8:11. Thus the first three lines and last line of text containing "the PA" have no asterisk marking them. Furthermore, right where 8:11 ends there is a raised dot, then an arche-symbol (Xi/Alpha Rho) in the line of text, followed by 8:12. The next line of 8:12 has an arche-symbol in the margin, two lines down from the last asterisk. In conclusion, the asterisks in E go along with the lexical symbols in the text to clearly mark out a portion to be skipped over in public reading--which is very important, as John 7:53-8:11 contains a lection-within-a-lection and needs to be marked boldly to keep the lector from missing his cues and stumbling around in front of the congregation looking for the rest of the Pentecost lection. These lexical markings have nothing to do with casting doubt on the authenticity of the passage. It is a mark of at the least brash ignorance, and at the most shrewd duplicity, to call upon them to exercise that function in support of omitting it from the authentic Gospel of John. You can see that the asterisks and lexical marks are rubricated, and that the asterisks are rather sloppily rendered, as if the scribe were in a hurry to draw them in and be done with it. He may have even made the exes first and gone back later to put in all the dots. Correction on the lectionary symbols: the symbol before παλιν is the αρξου 'resume' symbol and the symbol pointing to right after λεγων is the ἀρχή 'begin' symbol. Also, the symbol at the beginning of 7:53 is the υπερβα 'skip' symbol. This indicates the beginning of another short lection encompassing only the rest of 8:12, at the end of which is the τέλος 'end' symbol. I suspect that there is more to this than what I'm seeing, but I'm not sure what it is. Suffice it to say that the interplay of the symbols is confusing enough to account for the various states of disarray the PA finds itself in!